System and Maintenance is not only one of the biggest areas of the Control Panel, but also one of the most important. Transfer Files and Settings (Also known as, FAST or USMT). Here is a great example of the right tool for the right job. You only migrate settings once in a blue moon, but when you do, this is the tool that saves you hours of reconfiguring Microsoft Office and other applications. 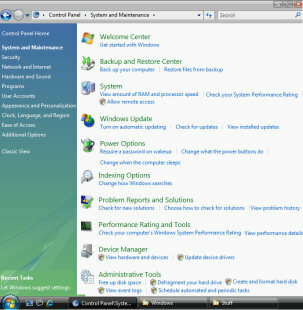 It’s handy that Microsoft has added Transfer Files and Settings to the System Maintenance section of Control Panel. Set up Devices – For when you add more hardware. View Details – Check ‘stuff’, such as Memory and Video Adapter. Backup and Restore is an example of Vista providing additional ‘doors’ to access settings. You can still go to Accessories, System Tools, Backup, else you can come here to the System and Maintenance, then select Backup and Restore. An interesting new setting is System Image. An old friend from XP and previous operating systems, remember the tip: Windows Key + Pause / Break to launch this interface. The System Icon has it’s own page. This important setting now has it’s own area, separate from the System Icon. Good news would be when Windows Update reports: ‘Windows is up to date’. Any problems or doubt, examine the ‘View Update History’ hypertext link. You may wish to tweak these Index and Search options. Don’t be put off if you found XP’s search slow and indexing cumbersome, Vista’s Index and Search are lightning fast. New smart center for troubleshooting problems. It looks as though the underlying wizard is proactive in identifying problems. I like the way it keeps a history of previous problem, because I often forget what I did the last time xyz happened. 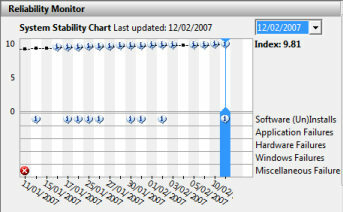 Vista has a promising new tool called: Reliability Monitor – Check your reliability Index. I was pleased with my Index rating of 9.81, especially as my friend ‘Mad’ Mick only had a rating of 5.91 on his Vista machine. Relatively simple settings for turning off the monitor and putting your Vista machine to sleep. Power Options is an essential setting on a laptop where you need to preserve battery life, still worth a look on a desktop computer. Here is a classic interface to check for devices that may not be working correctly. Make sure to include a visit to Device Manager when you are troubleshooting. Similar to the idea that’s been around since NT 4.0. A list of all the configuration snap-ins. However, many of these Administrative Tools have been improved since XP, for example the Event Viewer. In the production version of Vista Disk Defragmenter has been moved to a sub-menu of the Administrative Tools menu. The Disk Defragmenter starts off by asking you to check its schedule. Seems all the settings are automatic. I could not see any manual over-ride. No sign of the mesmerising block shifting graphics of previous defragers. This System Maintenance area is one of the biggest and most the important sections of Vista’s Control Panel. Take the time to find old friends and meet some new interfaces, such as Performance and Ratings.